All lovers of English music will have rejoiced at the reappearance of the Lyrita label in recent months. For many of us, at long last we’ve been able to acquire on CD performances that have languished in the vaults for many years and I’m sure we’ve all had our own favourite recordings that we’ve welcomed back into circulation with particular pleasure. In my case, this present release includes the most longed-for item in the whole Lyrita catalogue. Back in the 1980s, when I was working in Leeds I found in the city’s music library an LP containing two works previously unknown to me. These were the Parry and Vaughan Williams works that are included on this disc. I borrowed the LP a good number of times and enjoyed the Parry in particular but I never got round to buying the LP for myself and in due course it disappeared from the shops. It wasn’t until some twenty-five years later that I had the chance to reacquaint myself with the Ode on the Nativity when the choir of which I’m a member celebrated the 150th anniversary of Parry’s birth by learning the work and giving a series of performances. By then I’d become familiar with a reasonable amount of Parry’s music, thanks in particular to Matthias Bamert’s fine recordings for Chandos. The opportunity to learn the Ode from the inside made me realise what a very fine work it is. The other two works on this CD are available in other recordings but this Willcocks performance is, thus far, the only recording of the Parry. As such, and on account also of the quality of the work, I make no apology for devoting the bulk of this review to the piece. It’s one of Parry’s last major works. He composed it for the 1912 Three Choirs festival, which was held that year in Hereford. Coincidentally another Christmas work by an English composer was premièred at the same festival: Vaughan Williams’s Fantasia on Christmas Carols. That piece has secured the enduring place in the repertoire that Parry’s work has not attained. I honestly don’t think that that’s any reflection on the respective musical merits of the pieces. I suspect that it has more to do with the fact that RVW’s work is briefer, less extravagantly scored and, in its use of traditional carol melodies, more immediately appealing. Parry’s work was out of print for a good number of years and, indeed, when our choir came to perform it in 1998 the choral scores were only just being republished – by a small, independent publishing house - and I seem to recall that the orchestral parts were still in manuscript. I hope that the return to circulation of this fine recording will win new admirers for the piece and lead to more performances for it’s a quite splendid work and one that shows Parry writing with all his great experience of choral and orchestral writing. Anyone who invested in Hyperion’s 1997 recording of Job (1891/2) and who, like me, was slightly disappointed with the work can rest assured that Ode on the Nativity is a much superior creation. I think it helps that Parry chose a fairly tightly constructed text. The Ode by the Scottish poet, William Dunbar (c1460 – c1520) is cast in seven stanzas, of which Parry omitted the fourth. He used an English translation by an unknown hand. A particular help in the musical structure is that each of Dunbar’s stanzas ends with a one line refrain: "Et nobis Puer natus est" or a slight variant on those words. Parry uses this line as a kind of musical gathering point at the end of each stanza. The third stanza ("Sinners be glad") begins with a lovely, easeful soprano solo, which Teresa Cahill sings very well indeed. This passage [from 8:40] is vintage Parry both as to melody and harmony. One small point I noticed is that in the last couple of bars of this solo Miss Cahill sings a different word underlay to what is in my score. It’s a very minor point and it may well reflect the fairly recent republication of the vocal materials to which I referred earlier. The setting of this entire stanza [to 11:31] is quite enchanting and the performance is excellent. And so to the final stanza and a moment of true grandeur ("Sing, heaven imperial"). Willcocks handles the build up to this moment marvellously and when the moment arrives it is suitably majestic with Teresa Cahill surmounting the ensemble thrillingly. Another double choir section follows immediately. This is marked animato and the writing becomes more exultant and the textures increasingly complex until the work’s climax is reached ("All Gloria in excelsis cry!") Willcocks and his forces are fervent here and the music is put over with real joy and celebration. And then, almost as soon as the climax has arrived it is past and Parry winds down the piece in music of impressive tranquillity, returning eventually to the opening pastoral material. The very end is glowing and the performers realise it extremely well. The choir sings with huge commitment throughout the performance. The orchestral playing has fire where called for and sensitivity elsewhere. Teresa Cahill sings the demanding solo part very well indeed and Sir David is the complete master of the score. This may well be the only recording the piece will ever receive. Praise be that it’s such a good one. Both of the other works on this disc were, I believe, previously unrecorded until these Lyrita versions appeared on LP; that’s certainly the case with The Sons of Light. Subsequently both have been recorded by other artists but these Lyrita issues still have a strong claim on listeners’ attentions. I haven’t heard the Naxos issue of the Holst but The Sons of Light has come my way in a most interesting compilation of works by Vaughan Williams. Comparing David Lloyd-Jones’s Naxos version with the Willcocks reveals, I think, that the earlier version has several distinct advantages. The Willcocks performance and its recorded sound have greater impact and presence, I find. This is especially apparent in the first of the three settings that form the piece, ‘Darkness and Light’. Much of this is strong, vigorous music and, good though the Naxos performance is, that’s even more apparent under Willcocks. There’s some vintage Vaughan Williams orchestration to savour in this work; after all, though RVW wrote it for a chorus of children he expected a professional symphony orchestra – Boult and the London Philharmonic at the 1951 première - to accompany them. The instrumental scoring, for a substantial orchestra, often brings to mind the last three symphonies and Hodie, most of which lay in the future, as Bernard Benoliel points out in his notes. Particularly worthy of note is the accompaniment at the words "the dazzling plains lie shadowless below". And I was also struck, a little later on, by the orchestration around 6:00 when the text conjures up images of icy cold conditions and the scoring is right out of the almost-contemporaneous Sinfonia Antartica. Incidentally, having commended Willcocks for the drive and vigour of his reading I should make it clear that he’s equally responsive to the more subtle, reflective passages in the music. The work ends with a powerful, jubilant march-like movement setting Ursula Vaughan Williams’s poem ’The Messengers of Speech’ – all three poems used are by her and were written specially for this work. This seems to me strongly to prefigure the last movement of Hodie (1954) and Willcocks brings it off splendidly. Though the occasion for which The Sons of Light was written meant that it was first performed by a massed choir of children Vaughan Williams made few concessions to the youth of his singers. Here the Bach Choir give a splendid, ringing account of his music and the highly colourful orchestration is safe in the hands of the LPO. Good though David Lloyd-Jones is, it’s Willcocks who better conveys both the exuberance and the poetry of The Sons of Light. The Naxos version of this work is a good one but I came away from my comparisons with the firm view that the first recording remains the best – but how good to have choice in what is, after all, one of RVW’s less frequently heard works. I have to say I’m less enamoured of The Mystic Trumpeter. There’s nothing wrong with the performance but I find it hard to get on with the piece. I think there are two reasons for this. One is the fact that Holst chose to set the text solely for soprano solo. There were several occasions when I thought the music was crying out for the intervention of a chorus, and so were the words. Which brings me to my second problem: this is a choice example of Walt Whitman’s verse at its most high-flown and orotund. Sometimes I can take Whitman in musical settings but this not one of them, I fear. The imagery is just too earnest and flowery for its own good. Sheila Armstrong has a devilishly tricky part to sing. It’s wide ranging, not only in terms of vocal compass but also in terms of emotional range. Furthermore, at times Holst requires his soloist to sing with great dramatic power and at others with an almost confiding intimacy. Miss Armstrong copes with all these demands with conspicuous success but, as I say, it might have made for a better piece if Holst had employed a chorus in some passages. The orchestration gives more than a few hints of the mastery that lay just a few years away but sometimes it’s very heavy, lacking the great subtlety that Holst was to develop. In her note Imogen Holst quotes a perceptive critic who, after the first performance in 1905, predicted that "the mind which imagined it is bound one day to achieve something approaching absolute greatness." I think that’s a just verdict but I doubt that even the spirited advocacy of these present performers will, on further listening, persuade me to regard this as a favourite Holst work. I’m sure that other collectors will have a different, more positive view of The Mystic Trumpeter. I hope many will share my liking for The Sons of Light. But both of these works are available in other versions. 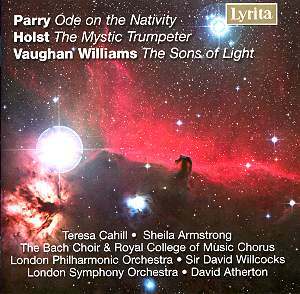 This CD represents the only opportunity at present to get to know Parry’s magnificent Ode on the Nativity and that’s the really urgent reason for acquiring this disc. It’s been a great thrill to return to this recording but with the additional benefit now of knowing the piece from the inside as a result of performing it several times. It’s a wonderful work, right in the heart of the English choral tradition and I urge all lovers of English music of this period to seize this opportunity to get to know it. You won’t regret it. With excellent sound, splendid performances, authoritative notes and fine music this CD is truly a complete package. The reappearance on CD of these performances is a cause for great celebration.